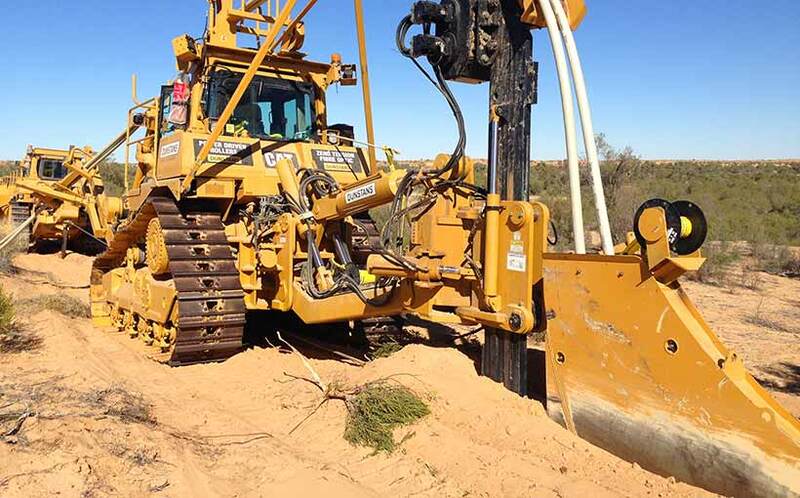 Dunstans has successfully ploughed in Dual 4.5″ Flexpipe line pipe in the Copper Basin for Senex Energy. The first installation (as part of a 2 year contract Dunstans has been awarded with Senex Energy) was to install Dual 4.5″ Flexpipe line pipe for a distance of 7km – combining ploughing and trenching techniques. Dunstans has developed the Dual Plough; which has set a new standard in pipe ploughing adopting a driven roller technology derived from 25 years of ploughing Fiber Optic Cable (FOC). This method ensures the integrity of the pipe is always maintained. The method has been very successful with installation rates of up to 1 kilometer per hour. Dunstans plough also simultaneously installs the marker tape and FOC.